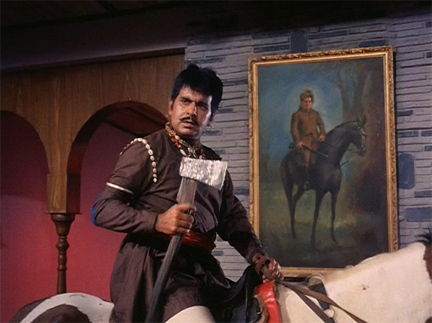 The film is Aaya Toofan (1964), starring Helen and Dara Singh (the wrestling champion). I am probably the only person who has ever seen it. VERY low-budget! It is beyond bad, but the “special” effects are good for many many laughs. 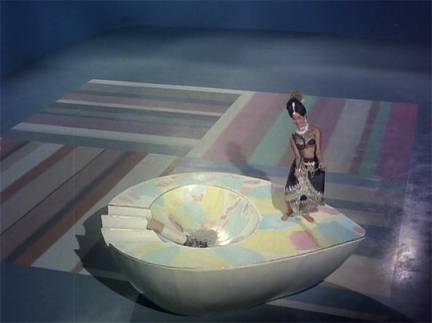 Also Helen had oodles of songs and dances, always a big plus for me. I was writing the answer to Trivia question #4, and was going on and on, when I realized that the film should just have a post unto itself. 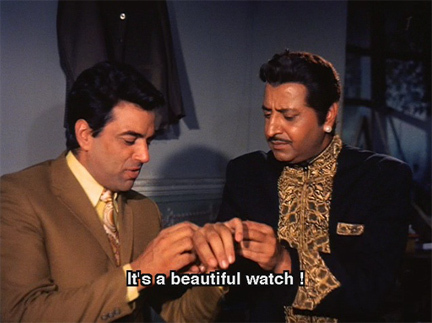 Mem Sahib is one of my favorite Shammi Kapoor movies—he gives a remarkably restrained and subtle performance in it, resisting the hamming that he often displayed at the height of his career. He is charming but not overbearing. And though it is early in his career (what he calls his “male starlet” days), he plays a negative character—long before Shah Rukh “broke tradition” by playing negative characters in Baazigar and Darr. 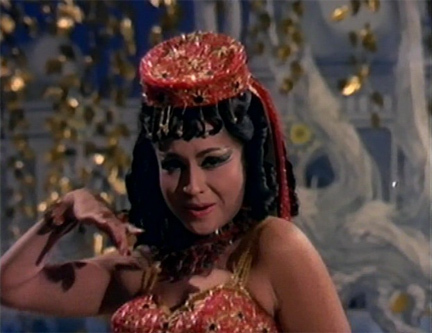 Meena Kumari is scintillating—a far cry from the teary, self-sacrificing woman I’m used to seeing “The Tragedy Queen” play. She is gorgeous and full of life, a real treat to watch. 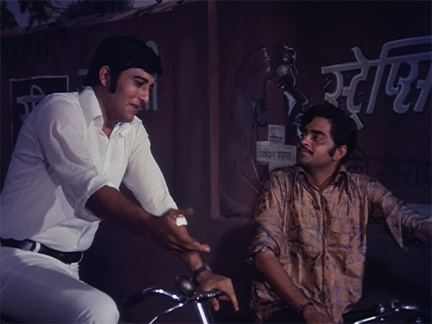 Kishore Kumar plays Sundar, a naive, sheltered and good-hearted man trying to figure out how to exist in a world completely at odds with what he is used to or expected; the film is peppered with the humor that he is so clever at. Well, people seem to like these little quizzes and I have to confess that I can probably keep them coming for quite a while…as long as my memory (not to mention the OCD) stays relatively stable (so no guarantees). 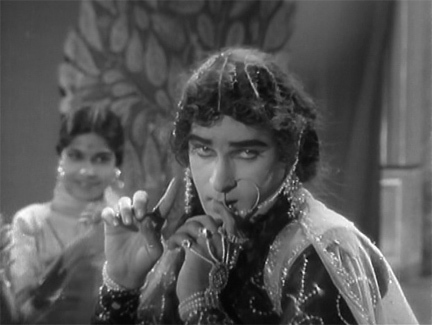 Here’s another Shammi-related question: In which of his early movies did he play a bad guy who loses the girl in the end (bonus points if you know who the hero was)? 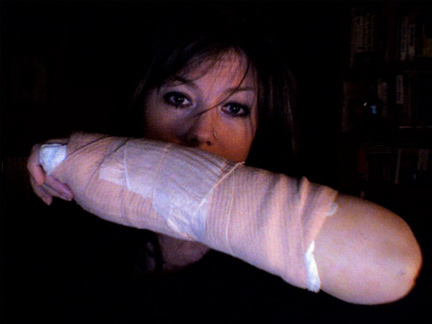 Since I am still one-armed, screen shots are easier to post than words. 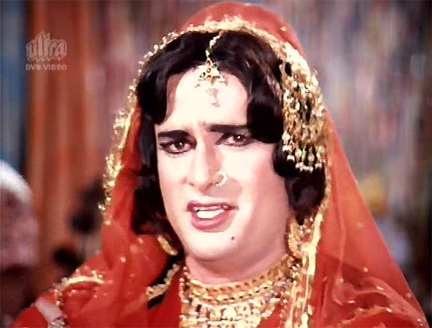 so…in what film did Shashi Kapoor do a nautch-girl number? 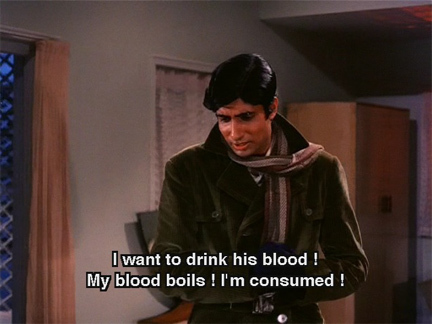 how about his brother Shammi (this is basically a freebie)? Kaddele is today’s winner with the correct answer of Shankar Dada for Shashi and Bluffmaster for Shammi…and she gets bonus points (which are sadly worthless) for her info on Haseena Maan Jayegi—which I will look for immediately! These scenes are all from one movie. What movie is it? The prize (which is nothing more than the satisfaction of being the winner!) goes to Nina for knowing that this movie is Guddi (1971) *ing Jaya Bhaduri, Dharmendra (playing himself) and a host of guest actors. 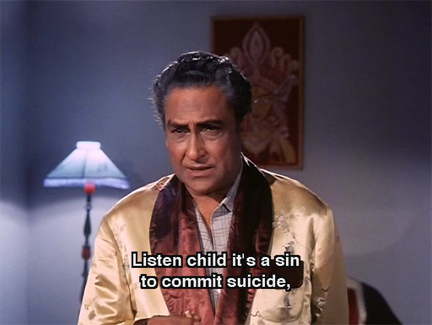 A truly wonderful movie from Hrishikesh Mukherjee! I will start off here by saying that I loved this film. As tired as I was last evening (red-eye flight the night before), I could not turn it off. I had to see what would happen next. Vijay Anand’s particular brand of brisk direction combined with a great plot and a myriad of wonderfully etched characters large and small is evident throughout. 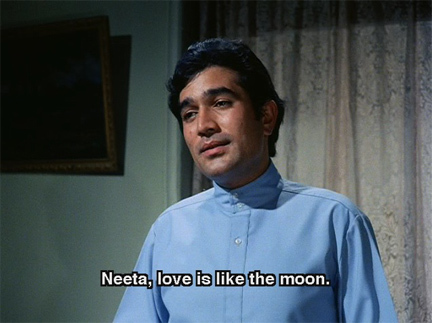 I have recently seen two of his gems from the same time period: Johny Mera Naam and Chhupa Rustam. This film is more serious than those two; a different genre more in keeping with Guide than with Jewel Thief. I found its messages about medicine and priorities just as relevant as it was 36 years ago. And the many songs by SD Burman are sublime. She doesn’t need any other name. Every Hindi film fan knows her simply as Helen. She shook her groove thing onscreen through 3 decades of cinema, before bowing out as gracefully as she shimmied in.